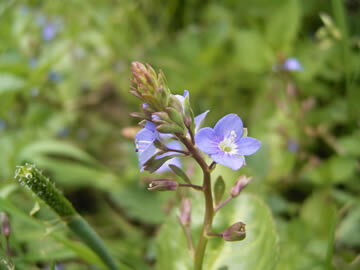 Synonyms and Other Names: European speedwell, Water Pimpernel, Becky Leaves, Cow Cress, Horse Cress. Identification: Veronica beccabunga is an emergent perennial herb with horizontal or ascending stems that root at the nodes. The plant is smooth and shiny in appearance and has succulent, hollow stems that root and creep along the ground at the base. It has pairs of short, stalked, oval-oblong leaves that are thick and leathery in texture and are about 1 1/2 inch long, with slightly jagged or sinuated edges. Each pair of leaves has two flowers that stems from the upper leaf axils. Flowers are 2-4 inches long and about five millimeters wide with blue petals and a white eye. Occasionally, V. beccabunga flowers may be pink (Grieve 1995; Anderberg 2005). Several subspecies of the plant occur. Studies of these species show that the plants present in eastern North America are of the beccabunga subspecies, which is distributed in Europe (Les and Stuckey 1985). V. beccabunga can be distinguished from the native Veronica americana by its leaf blades. In V. beccabunga, the blades are broadest above the middle and rounded at the apex. In V. americana, the leaf blades are broadest below the middle and the general outline of the leaf is thus more acute toward the apex. The style of V. beccabunga (part of the pistil that connects the stigma to the ovary) is distinctly shorter than the capsule, whereas V. americana styles are similar size as or slightly shorter than the capsules (Reznicek et al. 2011). Table 1. States with nonindigenous occurrences, the earliest and latest observations in each state, and the tally and names of HUCs with observations†. Names and dates are hyperlinked to their relevant specimen records. The list of references for all nonindigenous occurrences of Veronica beccabunga are found here. Ecology: Veronica beccabunga occurs in most types of wetland and riparian habitats, although it is predominantly found on the muddy margins of brooks, rivers, ponds, and lakes (Lansdown 2013). While it is found at lake margins, it prefers lotic environments with cold, oxygen-rich waters and does not do as well in lentic environments (Les & Stuckey 1985). It is able to tolerate drying due to its ability to produce terrestrial forms along shores and it sometimes occurs in the draw-down zones of lakes and in ditches and canals where water is relatively shallow or the bank slopes are gentle enough to allow it to root (Lansdown 2013; Stodola 1967 in Les and Stuckey). Some observations of V. beccabunga indicate that this species is resilient to disturbance. V. beccabunga can be uprooted in storm events but it recovers quickly, and habitats that are affected by siltation are vulnerable to colonization (Haslam 1978 in Les & Stuckey 1985). In Iran, V. beccabunga begins blooming in April or May, but in northern climates it is reported to flower as early as May or as late as August (Taheri & Shadkami-Till 2012; Anderberg 2005; Grieve 1995). This plant also is a resource for pollinating insects and some species of leaf eating insects throughout its native range (Taheri & Shadkami-Till 2012; Bienkowski & Orlova-Bienkowskaja 2015; Grieve 1995). The fly, Syritta pipians, Honey Bees, the larvae of the moth Athalia annulata, and the larvae of the beetle Phaedon armoraciae all have been reported to pollinate or feed on V. beccabunga (Bienkowski & Orlova-Bienkowskaja 2015; Grieve 1995). Means of Introduction: An early record from solid ballast ground at Hunter’s Point, Long Island, New York in 1880, indicated that the plant was introduced in the solid ballast of ocean-going ships arriving from Eurasia. Impact of Introduction: Potentially invasive. Reportedly can form large stands. But many researches shown it is apparently posing little threat to aquatic communities. This plant is also regarded as one of the springtime food tonics. Remarks: Several subspecies of the plant occur. Studies of these species show that the plants present in eastern North America are of the beccabunga subspecies which is distributed in Europe (Les and Stuckey 1985). In the past, this plant was occasionally used to treat scurvy (Usher 1974). Anderberg, A. 2005. Bäckveronika: Veronica beccabunga L. http://linnaeus.nrm.se/flora/di/scrophularia/veron/verobec.html. Created on 11/15/2005. Accessed on 06/15/2017. Bienkowski, A.O., and M.J. Orlova-Bienkowskaja. 2015. Trophic specialization of leaf beetles (Coleoptera, Chrysomelidae) in the Volga Upland. Biology Bulletin 42(10):863-869. https://www.researchgate.net/profile/Marina_OrlovaBienkowskaja/publication/284283893Trophic_Specialization_of_Leaf_Beetles_Coleoptera_Chrysomelidae_in_the_Volga_Upland/links/574457f008ae9f741b3d071a.pdf. Doganlar, Z.B. 2012. Physiological and genetic responses to pesticide mixture treatment of Veronica beccabunga. Water, Air, and Soil Pollution 223(9):6201-6212. dx.doi.org/10.1007/s11270-012-1350-y. Grime, J. P., J. G. Hodgson & R. Hunt. 1988. Comparative plant ecology. a functional approach to common British species. Unwin Hyman, London, UK. 742 pp. Grieve, M. 1995. A Modern Herbal: Brooklime. http://www.botanical.com/botanical/mgmh/b/brookl69.html. Accessed on 06/15/2017. Lansdown, R.V. 2013. Veronica beccabunga. http://dx.doi.org/10.2305/IUCN.UK.2013-1.RLTS.T167923A13574152.en. Accessed on 06/15/2017. Les, D. H., and Stuckey, R. L. 1985. The introduction and spread of Veronica beccabunga (Scrophulariaceae) in Eastern North America. Rhodora 87(852):503-515. Reznicek, A.A., E.G. Voss, and B.S. Walters. 2011. Michigan Flora Online. http://michiganflora.net/. Taheri, E., and H. Shadkami-Till. 2012. Phenology of Veronica beccabunga flowering in NW Iran. International Journal of Forest, Soil and Erosion 2(2):74-77. www.ijfse.com.